The Pega 7 Platform decision management functionality makes it possible to connect to an external Hadoop distributed file system (HDFS). By associating the Pega 7 Platform with an HDFS, you can access very large data sets that are stored on multiple servers that operate in parallel. This tutorial provides an overview of the HDFS data model and guides you through common types of HDFS operations on the Pega 7 Platform. HDFS is a distributed file system that runs on commodity software and stores very large files (gigabytes or terabytes of data). HDFS represents the structure of files and directories in a tree. It also includes various attributes of directories and files such as ownership, permission, quotas, and replication factor. You can view the structure of HDFS data by using the Preview file option in the Data-Admin-SataSet-HDFS rule form. It is helpful to examine and understand the structure of the data before processing it on the Pega 7 Platform, for example, mapping the data to properties. You need an instance of the HDFS data set and a configured instance of the Hadoop record. On the Pega 7 Platform, access the target HDFS data set. In the File system configuration section, specify the path to the file that you want to preview. Click Preview file. This action returns the first 100 kilobytes of the file. Save - As data flows save records in batches, the save operation must append data to an existing data set and not override it. For that reason, each save operation creates a data file. For example, if the file path in the data set configuration is specified as /ds/customers.csv, each save operation on that data set creates a file with the following indexing: /ds/customers-00000.csv, /ds/customers-00001.csv, /ds/customers-00002.csv, and so on. Browse - Retrieves all data from the HDFS file. Truncate - Removes all data files from a specific HDFS file path. For example, if the file path in the data set is specified as /ds/customers.csv, the truncate operation deletes not only /ds/customers.csv, but also /ds/customers-00000.csv, /ds/customers-00001.csv, and so on. The result of the truncate operation is always an empty file path. Before running Browse or Save operations, you must configure parser settings and property mapping. 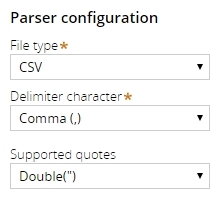 From the Parser configuration section, choose the file format for the data set. Currently, the CSV and JSON (with one JSON object per file row) formats are supported. When you select a file format, additional configuration sections are displayed, depending on your selection. Test connectivity to the target Hadoop instance. In the Connection section, click Test connectivity to verify the connection. In the File type property, select the file format that the HDFS data set uses. Only for the CSV format: Specify the Delimiter character property. Only for the CSV format, optional: Specify the Supported quotes property. You use the property mapping functionality of the Pega 7 Platform to associate data fields that are received from an external database with the properties or other sources or destinations in the Pega 7 Platform. The type of property mapping that you can perform depends on your parser settings. By default, the auto-mapping mode is enabled. In this mode, the column names from the JSON data file are used as Pega 7 Platform properties. This mode supports the nested JSON structures that are directly mapped to page and page list properties in the data model of the class that the data set applies to. To use the auto-mapping mode, select Use property auto mapping. This mode is enabled by default. 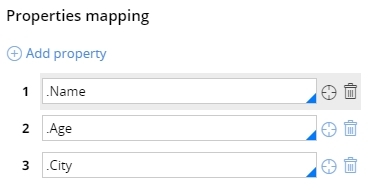 Clear the Use property auto mapping check box. In the JSON column, enter the name of the column that you want to map to a Pega 7 Platform property. 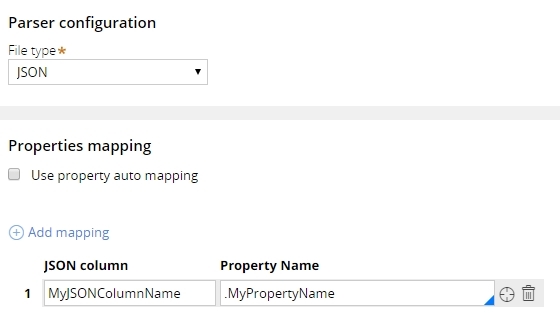 In the Property name field, enter the name of a Pega 7 Platform property that you want to map the JSON column to. To add rows, click Add mapping. Property mapping for the CSV format is based on the order of columns in the CSV file. Therefore, the order of properties in the Property mapping section must correspond to the order of columns in the CSV extension file. In the numbered field that is displayed, enter the property name that corresponds to a column in the CSV file. You can perform save, browse, and truncate operations on an HBase data set. Open an HDFS data set instance on the Pega 7 Platform. 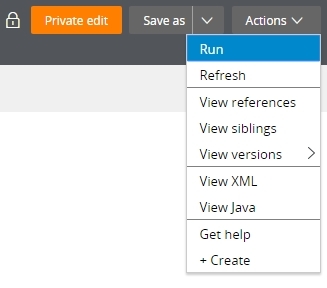 Click Actions > Run. The Test Page dialog box is displayed. On the Test Page, expand the Operation menu. Select one of the available operations and click Run.